We must love them both, those whose opinions we share and those opinions we do not share. They’ve both labored in the search for Truth and both have helped us in finding it. Thomas was born in 1225 at Roccasecca, a hilltop castle from which the great Benedictine abbey of Montecassino is not quite visible, midway between Rome and Naples. At an early age he developed a profound love and reverence for the scriptures. He was able to memorize large sections and stunned his teachers with profound questions about God. He also developed a great love for meditation and solitude. He was often to be found in solitude. Educated by Benedictine monks at Monte Cassino, and at the University of Naples. He joined the Dominican friars in 1244. He studied in Paris from 1245-1248 under Saint Albert the Great, then accompanied Albert to Cologne. Ordained in 1250, then returned to Paris to teach. Taught theology at University of Paris. He wrote defenses of the mendicant orders, commentaries on Aristotle and Lombard’s Sentences, and some bible-related works, usually by dictating to secretaries. He won his doctorate, and taught in several Italian cities. 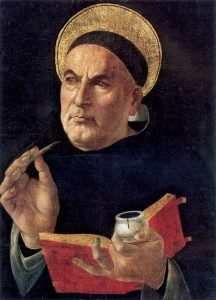 Recalled by king and university to Paris in 1269, then recalled to Naples in 1272 where he was appointed regent of studies while working on his most famous work: the Summa Theologica. On 6 December 1273 he experienced a divine revelation which so enraptured him that he abandoned the Summa, saying that it and his other writing were so much straw in the wind compared to the reality of the divine glory. He died four months later while en route to the Council of Lyons. His works have been seminal to the thinking of the Church ever since. They systematized her great thoughts and teaching, and combined Greek wisdom and scholarship methods with the truths of Christianity. Pope Leo VIII commanded that his teachings be studied by all theology students. He was proclaimed Doctor of the Church in 1567. Thomas experienced many mystical experiences in his life. There are numerous stories of Thomas being absorbed in various states of enchantment and being unconscious of his surroundings. Despite this he was a prolific author and wrote over 100 works in his life. “I can no longer write, for God has given me such glorious knowledge that all contained in my works are as straw – barely fit to absorb the holy wonders that fall in a stable.” Three months later he died.